The Chinese girls and my two kids are busy, busy, busy. This week they’ve gone to Seven Peaks, hiked to Timpanogos caves, went shopping at University Mall and Walmart, and today spent the day downtown in Salt Lake. The only down side is, they are so tired when they come home. They don’t really want to interact with us or hang out with the Americans. They would rather go up to their room, read, write in journals, take showers, and just relax without having to think too much. I understand. I remember those first few weeks in a foreign country. Tonight we’re going to try “make your own pizza night” and see if they open up a little bit more. Since the big kids are off having fun afternoon, and when I’m not driving three times a day to Provo, I’ve been trying to do fun things with the three younger kids. So WE’VE gone swimming, we went out to lunch at Mimi’s Cafe, and we went to the mall ourselves. We had a BIG talk about how to behave in the mall and how just because we saw something we liked we were not going to be buying lots of things. They (meaning John, mostly) agreed to the rules and behaved much better than the last time we went to the mall. But he was not happy until he had spent his allotted $5 of allowance money on a small overpriced motercycle. On Saturday, I think we’ll check out Thanksgiving Point, and then go to the Folk Festival in Springville at night. I want to give them the most possible experiences while they are here, but not totally overwhelm them with things to do every minute. Sunday is church. Do you think we should have them go the whole 3 hours to church, or let them off easy and come home after the first meeting? Hmmm? Things just keep on happening around here. Yes, the play is over, but that doesn’t mean that we’re winding down. I mentioned that we had houseguests, right? We had fun with them all week, and are so glad they made the trek up to Utah to play with us. We played, we swam, we hiked, they hiked some more (Robin took four kids up to the top of Timp–the mountain, not the cave), we had our toes done, we ate, we had fun. Then for Pioneer Day we hosted a Relief Society Activity where we met at the John Rowe Moyle house in Alpine. If you are local and have never been there, you should. You’ll learn about pioneer times, and an amazing man who never stopped doing what he should. On Friday we picked up our two exchange students from China. They go by American names so that we can pronounce them. Daisy and Vivian they are called. When I asked how they got their American names, they said that they picked them out themselves. I’m a fan of picking your own name, so I can understand. I’m hoping we can actually learn and pronounce their real names correctly by the time their visit is over. On Saturday, July 24th, which is Pioneer Day, we met for a ward breakfast/primary activity. After eating, the kids walked around the track and heard a few pioneer stories. Then it was time for the big event. The firetruck! For little boys, nothing is cooler than a firetruck. And cool it was. They hooked up to the fire hydrant and sprayed everyone who wanted to get wet. Here’s an action shot of Megan’s friend. Can you see the force of the water hitting the grass? Eventually, the goon squad started grabbing people and throwing them in. They even went so far as to pick Ryan up and CARRY him into the stream of water. That’s Ryan there in the center. After that, my friend Lisa and I knew we were not safe, so we linked arms and walked into the mist voluntarily. We thought that would be enough for them, but NO, those bullies grabbed us and dragged us into the direct stream of the firehose until we were soaked. We walked home (squish, squish, squish) and changed our clothes, dried our hair and got ready for the day. Again. Then we headed out with the family and guests to Park City. We ate at the train diner in Heber, and then it was off to the Alpine Slide. My own kids had never been before, so we thought it would be a fun activity for all of us. And we were hoping to escape the 100 degree heat. While it was a little bit cooler up there in the mountains, it wasn’t that much cooler. We did have fun, though. Our girls didn’t go very fast. Maybe you can see the line of people behind them. Oops. But they had fun. John, however, told me he never EVER wanted to go on that slide again! That’s what you get for riding with DAD, who went as fast as possible. We had thought we might go to Butlerville days with my parents, but the idea of sitting through a parade at 4 pm and then all those games and stuff in the heat was just too much for us. We ended up coming home. Everyone was pretty wiped out and I think the girls took naps before dinner. On Sunday, there was a family occasion, as Ryan’s nephew came home from his mission in Peru. We went to their church and then there was a big family lunch at Ryan’s brother’s house. The girls, even though they didn’t know anyone except us, held out pretty well. I was remembering how long and boring church can be when you don’t really understand the language, let alone the church service. I think it was good that we only went to Sacrament meeting, instead of all three hours of church. Monday their classes started up. They have classes and activities at their school in Provo from 8:15 until 5. My two oldest kids are signed up as “buddies”, so they go every day for about 6 hours. They do one hour of English class with them, then have lunch, and then do an activity. On Monday they basically played games. Tuesday Cole and Megan went at 8:15, and the activity was to hike to Timpanogos cave. I know. We just did that last week. Aside from the fact that I’ll be driving to Provo once or twice a day for the next 2 1/2 weeks, I think they are in for a lot of fun. They all came home tired today, but I think they had a good time. Wednesday’s activity is swimming and waterslides at Seven Peaks, and so on. We try to do something fun (that they aren’t already doing) on the weekend. We’re still undecided on this weekend, though. Any ideas? It should be a fun packed couple of weeks, and an experience the kids will not forget. I can’t afford to take my kids to China, but I can give them some memories and experiences with our Chinese friends that will last forever. My husband assures me that if I have seen this and he’s seen it, that EVERYONE else in the world has already seen it. But it’s too funny to not pass along. Hey, it’s summertime! And we’re not ONLY doing a play around here, we’re doing other stuff, too. Like go to the farm. The kids love Farm Country at Thanksgiving Point, so we went there for some fun animal time. We went after dinner so it wasn’t crowded, and the kids had a blast, as usual. They pestered me about wanting to get goats, bunnies and chickens. Maybe someday, kids. We had our family reunion camping trip last week, and we had a fun time at Payson Lakes. And by fun, I mean we didn’t get much sleep, got really really dirty, and spent about as much time getting ready and cleaning up after the trip as we spent actually camping. Like playing at the lake. The kids had a blast at the lake, as they usually do around water. Robin and kids are here visiting from Arizona. They have to do something to escape the heat, and we’re happy to have them come. The kids have so much fun together. We started early to avoid the heat, and that mile and a half up is a killer! But we made it, toured the caves, and had a good time, well, let’s just say we made it. We finished up the show. Last night was closing night for the Wizard of Oz. It was a full house and we all did our best to put on the best possible show. It was wonderful. I’ve had a blast. I’ve made new friends, I’ve learned new songs and dances, and just enjoyed my time with Alpine Community theater. Natalie also had a very good time with the play, although it was a little sad that we were not in any scenes together. Alpine Community Theater is very professional and does a wonderful job. It’s seriously community theater at it’s best. I’m so sad that it’s over, but I’m relieved and glad to be able to have some free time back. So, as you can see, even though my life has been consumed with the wizard of oz, we’re still busy with the summer. Stay tuned for more adventures. Things like toilet replacement, more hiking, swimming, pioneer day, and even visitors from China! Last night we had another performance of Wizard of Oz. We have a cast meeting at 6:30 where we get notes, warm up, have a devotional and prayer, and get ready to perform. At 6:45, the director still wasn’t there to begin the meeting. When she came in, she looked very upset. Somehow the lighting cues had been wiped out. And when they tried to run the light board manually, the numbers weren’t corresponding, either. Light #2 would light up as #5, and so on. They were keeping the audience out of the auditorium while they tried to get things figured out, and were going to try to start 1/2 hour late, at 7:30. If they couldn’t get things working, they would have to send everyone home and hope they would come back for a different show. She asked Bill, who was doing the devotional and prayer, if he could please ask for a special help and if we could use our combined faith to ask for heavenly help. He gave a beautiful prayer, asking for help with our technical difficulties, so that we could perform for friends and family who were in attendance. He asked that we could put on the best show that we could possibly do. The director disappeared, and we continued getting ready. At 7:30, the show started, so we assumed they had gotten it worked out. During the show, I didn’t notice any extremely awkward dark spots or light spots, although I’m not on stage all that much, so maybe there were some. I did hear from someone that the stage crew were moving scenery and it wasn’t all the way dark, but generally it looked like they had somehow managed to either manually operate the lights, or program them in time. I am thankful for small miracles. After the show, the cast goes out into the cafeteria/auditorium they call the cafetorium and greet the audience members. It gives people a chance to meet or take a picture with their favorite character, and gives the cast a few more minutes to bask in the after show glow. The director walked up and I said, “You must have gotten things figured out, right?” She gave me a hug and said, “That was the worst show of my life. I don’t ever want to go through that again. But we made it through.” I’ve seen her rattled and I’ve seen her stressed out, but I’ve never seen her as emotional as I did last night. I told her that my wish for her was to sleep in the next day and enjoy her day off. I don’t know if she was able to do that, but I hope so. As actors, we often forget ALL the work that’s going on behind the scenes. Sure, we know of scenery changes, and we help with all those things back stage. I myself spend a few scenes behind the witches castle just to help open and close the window curtains so the witch can make it through. One of my friends climbs underneath the castle to help the witch unhook her skirt to help with the melting. But we don’t realize the magnitude of the technical aspect of the show. We can be as talented as Broadway stars, but if the audience can’t see us, or can’t hear us, it won’t matter. It’s like that in life, too. Each of us has a support staff to make us “look good on stage”. We have teachers, parents, spouses and friends who keep us in the spotlight. Friends who rescue us from stupid mistakes or unfortunate experiences. People who help us laugh at ourselves when things go wrong and help us make the best of our experiences. But more than that, we have heavenly helpers. Angels who are there to help us look better or sound better than we actually are. Angels who help convey the message that is in our hearts when our words are not doing a good enough job. We have a Heavenly Father who rescues us from our own stupidity and an older brother who paid the ultimate price so that we can repent of our sins and make it back to live with him some day. I’m thankful for my tech crew–those that I know about, and those unseen. And for all the miracles in my life. Oh, things are busy around here. Very busy. Hubby did indeed come home from his long business trip, but he’s spend the last 5 days dead dog tired trying to recover. I’ve had rehearsals every night that go quite late, so I’ve also been pretty tired. But all the rehearsals have finally come to an end. For last night was OPENING NIGHT! I have SO many pictures, but I’ll try not to totally bore you with ALL of them. Here are the munchkins. Can you spot my Natalie? This is actually only 1/2 of the munchkins, as they have double cast a lot of the roles to let more kids be in the show. And here we are, the apple trees. I’ve had so much fun with these ladies. I know them both from previous shows, but they are truly a TON of fun, and I’ve had a blast with them. And see all those people? They’re having fun, too. Well, most of them are. The kids find it really long to have to sit around and do nothing the whole second act just to come on for the curtain call at the end. (There are no munchkins after about the first 1/4 of the show). We’ve had many laughs as we’ve rehearsed. I guess that’s one reason I just love to do these shows. It’s so much fun. The other night, they brought me a mic, but there was no clip on it or mike belt. I’ll just stuff the mic pack (which is about the size of a think deck of cards, but heavier) here in my shorts that I wear under my costume, I thought. But by the end of the show, the mic had slipped down through my shorts and was just dangling there, hanging by the cord. Not good. So, the next night I asked if there was an extra mic belt I could use. Nope. My fellow apple tree Felecia said to just stick it in my bra. Hmmm, that works. So, although I’m pretty sure that everyone who looks at me can see this big LUMP at the side of my bra (maybe I should get that checked, you think?) they’ve assured me that it’s not noticeable, and it’s actually a pretty secure place to keep a mic. But it makes me laugh, that’s for sure. Oh, and here’s a shot for your vampire fans. The family came last night for opening night. They enjoyed the show, too! Notice that we have a real dog playing Toto, which is a bit of a challenge. Last night he (she–her real name is Daisy) ran off the stage to her owner in the wings. She also whined a barked a lot when she was tied to the post by the scarecrow. I guess those crows forgot to give her the bone they had hiding there. But she really adds to the show, and the kids all love her. After opening night, it’s customary to go out to eat. We were invited out to Chili’s, and I invited the family. I wasn’t the ONLY person who brought family along, but almost. Jenna, John and Natalie came with Ryan and I, and the kids were super tired. I’ve met her and she’s quite nice. We got home well after midnight, and Natalie slept in until almost noon this morning. How heavenly does that sound? So, it’s one show down, and 7 more to do. We have a show tonight, but Natalie won’t be in it. She only gets to do four of the 8 shows, but that’s about right for her. Then she can still do some fun things and not be tied to the show every night. I wish you could ALL come see the show. It’s fabulous, if I do say so myself. There are really cool special effect, incredible scenery, and extremely talented actors. There’s an article about the show here and here. It’s so much fun. We’re off to see the the wizard, the wonderful wizard of oz. “Hey, hey,” I said urgently, “I’m using the bathroom here.” As in, not just using the bathroom, but–you know–using the bathroom. “But Mom?” he calls, thankfully from outside the door. “Yes? What do you need?” I asked. “I need someone to tie my shoes,” he said. “Can you get someone else to help you tie your shoes?” I asked. The whole family is home, in various stages of getting ready for church, so surely there has to be someone who can help him, right? “There isn’t anybody else,” he calls back through the door. “What about Dad?” I said. He makes that exasperated sound that is part sigh, part “Whatever” noise, and walks off. Personal Progress–now the whole family can get involved. Can I tell you how much I love the new Personal Progress program for the Young Women? When they changed to the new program with the new books and the cute ribbons and bookmarks, it really helped to motivate Megan. She has been working hard on her requirements and her value projects in the last 3 or 4 months, and I love it! For her faith project she’s helping with the garden. That means that when I ask her to go out and weed for 1/2 an hour (as I do on most weekdays in the summer) she does it. She helped plant and even helped make some new boxes this spring. And when it’s time to pick, hopefully she’ll help with that, too. Soon Natalie, my middle daughter, will also be 12 and she can start working on her PP program, too. I also started my own personal progress book on Sunday. With the new program, moms can get their awards along with their daughters. So I started working on mine. The nice thing is that as moms, we are already doing a lot of these smaller requirements. Plan and cook meals for your family for two weeks? Check. Memorize two hymns and then lead the music in your class or at a Family Home Evening? Well, it just so happens that I lead the music in Relief Society on Sunday, and I have more than two hymns memorized. Check. Be in a play or musical? Check. Pay tithing for three months? Check. Megan was a little irritated with me that I was checking things off so quickly, but I will actually have to work on a lot of these things. I’ll let you know how I do, and how I progress. “Well,” I said, trying not to sound too eager, “you could clean and organize the pantry.” I practically held my breath with anticipation. The pantry is a DISASTER! There’s spilled cereal, jam packed shelves, stuff everywhere, and I really don’t want to spend my own 10 hours on something like that. “Ok!” she said, and went to work. This child really likes to organize things. And she’s a hard worker, too. It took her all week to do, and there was a lot of stuff on the counter as she was doing it, but she got it done. Besides, the stuff on the counter wasn’t that bad since Ryan was out of town and I wasn’t really cooking all that much in the way of dinners, so I could stand the extra chaos. It started out something like this. I can’t believe I’m showing the horrible before pictures. You must all think I’m SUCH a total slob and a horrible housekeeper. I won’t show you all the pictures she took, but you get the general idea. Yes, we’re slobs. All of us. And lots of people in this house don’t know how to put things away. BUT, the mess has been averted. Now it’s all nice and organized, and we have a large garbage bag of expired, moth filled, or otherwise icky food that we will not be eating to give to our friend’s chickens. That will certainly brighten up their day, especially the bug part. After 11 1/2 hours of Megan’s hard work (thankfully not MY hard work) it looks more like this. My husband is still in Korea. He’s actually coming home Sunday (we hope). In honor of his trip I was watching M*A*S*H. Ok, It wasn’t really a choice. We have no cable channels because Comcast switched something or other on us and Ryan’s the only one who can install the special boxes they sent us. So, there’s nothing on. As I was folding laundry, I turned on the tv, and M*A*S*H was the best I could find. That Hawkeye sure is a character, isn’t he? And what exactly is Icore? 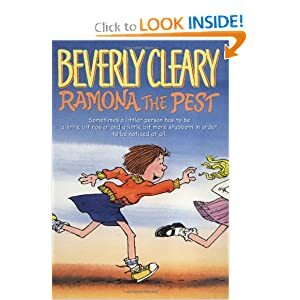 When I was a kid I used to LOVE the Ramona the Pest books. Love them. I read all those Beverly Cleary books. They were the thing to read for the elementary aged kid. Well, I picked up Ramona the pest on CD so that we could listen to it in the car. My kids really love to listen to stories in the car, and I’ve found that it keeps the fighting and arguing at a minimum on a long car ride. Even if a child groans when I start up the story or says they would rather not listen, once it starts they pay attention. As we started up Ramona today, I was laughing out loud. Oh, that book takes me back. Susan and her boing boing curls, Howie and his sister Willa Jean in the stroller, Beezus the big sister, the kindergarten teacher Miss Binny. The red boots that she gets stuck in the mud and Henry Huggins has to rescue. I also realized how much different my school days were from those of my kids. I could relate to the “resting time” in Ramona the Pest because when I went to Kindergarten, we actually did lay down on little mats and “rest”. Kindergartens seem to have so much to do now. Testing, reading readiness, field trips, programs. It seems they don’t have time to rest. And the teacher says “we don’t want you to be tired when your parents pick you up.” Um, yes we do. Wear them out at school! I would LOVE it if my kindergartener came home to take a rest. Most of the time they don’t, but they certainly won’t rest at school. Another thing my kids have probably never heard of… galoshes. Or the boots that you wear OVER your shoes. Who wears boots over their shoes? And rain slickers. In the book it said that all the boys looked the same in yellow slickers and brown boots. Now if it’s raining, the kids just pull up the hoods on their hoodies and call it good. And when her teacher comes out to help her when she is stuck in the mud, she is wearing a plastic rain bonnet or something like that. Here’s one I KNOW my kids would laugh at. Remember those little plastic cases like a tiny suitcase for Barbie that held a tiny plastic bonnet, all folded up? My grandma used to keep one in her purse, and I think my mom did, too. I don’t know how that thing would EVER fit back into that tiny box once it was unfolded, but I think they were reuseable. Remember those?